Posted By Nathan On March 24th 2015. Under Blog Tags: head hunting, head hunting in hr . The process of job hunting is one thing, the process of head hunting in HR is very much another. You’d be surprised how utterly different these processes are from the HR perspective. In this case, the “head hunting” is a ruthless check of job applications, hunting for the right candidates. “Head hunting” in its usual sense in the job market is the process of hunting highly talented people for hire. When head hunting, employers will research and approach prospective employees with offers of employment. When it comes to ordinary job applications, the process is a two way process, finding the most appropriate applicants and discarding the rest. That’s no minor, or simple, process. Statistics show that roughly about 75 applications are received for every open job. Obviously, not all of those people can get interviews, and only one of them will actually get the job. Now consider this. 78% of HR managers say that “at least half” of the applications written resumes they receive are from unqualified people! This very large number of unsuitable applicants means that they have to “head hunt” in reverse. Instead of approaching the candidates, these applicants are approaching them. The best way to find the best applicants, naturally, is to set the standards very high for acceptance. The process of finding those applicants is so efficient that most applications are reviewed within one or two minutes. That’s right – Your application will be assessed for an average of no more than two minutes. Using Application Tracking Systems, (ATS) and targeted criteria for applicants, those 75 applications will be processed very quickly and most of them will be automatically discarded at the ATS and manual screening stages. If you’ve heard those stories about hundreds or thousands of job applications for single jobs, those stories are quite true. That’s one of the reasons that the job application handling process is to put it mildly a yes or no process. It’s also one of the reasons that your job applications aren’t often successful. 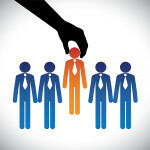 Success in job hunting is really a question of where the head hunting process draws the line. Comparing applications, it is natural that even those applications which do get through the screening process may be more or less competitive. If 100 applications are received, 20 will be considered for interviews, and perhaps only 10 will actually get interviews. Keep your resume up to date! Most studies show that roughly half of all job applicants don’t update their resumes regularly. Learn how to work with job application keywords! This is a classic error, and it’s one of the reasons most applications don’t even make it past the screening stage. If your resume isn’t getting results, consider a new resume format! Functionally writing resumes, for example, are extremely competitive, and very easy to work with. More information on HR and head hunting practices, please see this link. Images are taken from: gstatic.com, tc.pbs.org, techweekeurope.co.uk.